Valentine's Day is just around the corner and it really is one of my favourite times of the year to shop. I love looking for that special dress which I'm going to wear, I thought I would do a quick blog post and share some of my favourites which I found this year with you all. 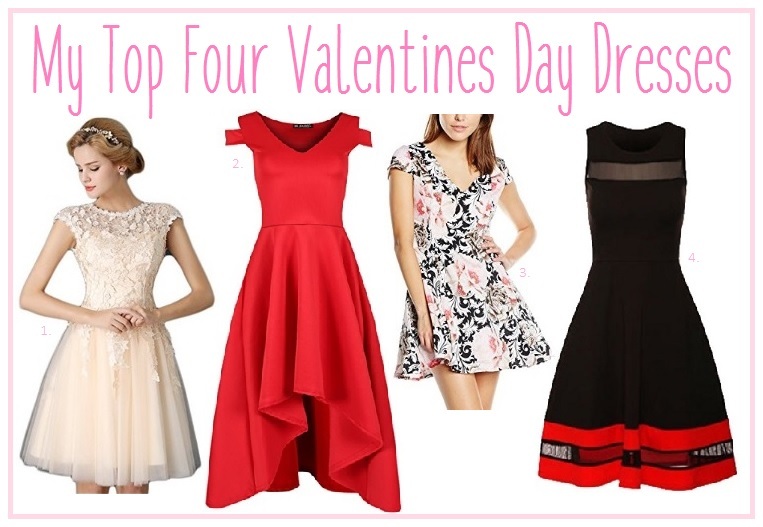 Also, comment below on your favourite dress or the dress you think would best suit me as I love all four of these dresses and can't decide on one to buy to wear for Valentine's Day. What are you going to be wearing for Valentine's Day this year? I don't celebrate Valentine's nowadays but I love a black or red dress! They go with a whole host of other colours and can be worn time and time again! That shoulder swing dress is stunning, I can't believe it's so cheap! Definitely going to check that site out! Thanks so much for sharing! My favourite is definitely number 4, I love the black and red together!